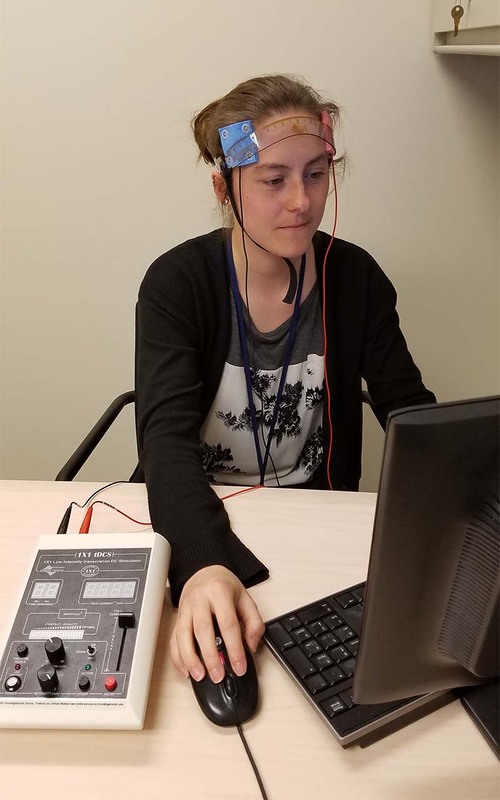 The Transcranial Direct Current Stimulation (tDCS) Study is one of the many studies currently ongoing at the Prechter Bipolar Research Program. Our enrollment goal is to have thirty participants, and as of March 26, 2019, we have enrolled 6 people. The purpose of the tDCS study is to test whether combining Transcranial Direct Current Stimulation, a type of non-invasive brain stimulation, with computerized cognitive exercises is helpful in improving a type of memory skill called “working memory” among people who experience mental health symptoms and difficulty with this memory skill. People with serious mental health conditions (bipolar disorder and schizophrenia/schizoaffective disorder) often have impaired neurocognition. They have difficulties with attention, learning, and problem-solving. In particular, working memory, which is the ability to hold information briefly in short-term memory, can be a problem for them. Our research goal is to find ways to help people living with serious mental health conditions improve their working memory in order to help them live more fulfilling lives. What happens to participants in this study? Our research participants undergo a diagnostic interview and paper-and-pencil cognitive tasks to determine enrollment eligibility. If they are enrolled, we then ask them to complete questionnaires about their current symptoms and everyday activities. Participation in this study includes three ‘assessment’ visits as well as ten ‘treatment’ sessions consisting of Transcranial Direct Current Stimulation treatments, and a total of 20 hours of cognitive exercises. The total time participants spend in this study is 4-8 weeks. During the assessment visits, the participants complete symptom questionnaires and cognitive tests. Participants come to our clinic for ten sessions of Transcranial Direct Current Stimulation that each last 20 minutes. They complete online cognitive exercises during and after the brain stimulation. tDCS treatment is considered safe and painless. It involves attaching two electrodes to a person’s scalp and applying a small electrical current to stimulate brain activity. Participants receive a personal login to a web-based cognitive training program and will complete ten hours of training exercises at home over 2-4 weeks. The exercises are game-like and are designed to gradually increase in difficulty to help build up cognitive skills. How could participants benefit as a result of taking part in this study? Research participants may not receive any direct personal benefits from being in this study. However, some participants may benefit from the Transcranial Direct Current Stimulation and/or the cognitive exercises. Many of our participants tell us that they get satisfaction out of knowing that they are personally contributing to finding answers to improving the lives for people with mental disorders.